I finished up my new fall scarf. 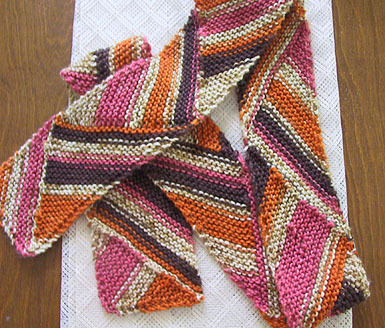 I used this pattern for a multidirectional diagonal scarf and my yummy dazzle yarn. Now that it’s finished I’m not sure if I like it. You think I’d notice this while working on it but I have a weird “project in progress” blindness that keeps me from determining if I think it’s working until after it’s complete. isn’t that handy? I liked the way the dazzle looked in stockinette stitch better than garter stitch, smoother, while this is definitely nubby. But I’m sure I’ll love it to death in about 5 minutes. Like I said yesterday, I’m a fickle pickle. I really like the colors of your scarf! I’m a fickle pickle too. Sometimes, that’s a good thing! So astounding how much a little person changes and grows in such a small amount of time! they would do well here in ontario…where it is freezing, and my hair could use some warm loving fashion. Ooh! I love the colors AND the zigzag pattern. Very nice!! You make the cutest things. I Love your kitty on auction. Here in WArwick, Queensland, we have an outdoor Textiles Exhibition last week in July when we dress over 60 decidous trees in the main street with “jumpers” created by artists from all-over. There are no entry fees, no prizes – just the sheer joy of creating a jazzy jmper for a tree feeling the cold on frosty mornings! Jazz is featured for the week, workshops are held and groups gather to knit and crotchet in the street. love the scarf! this may sound a little crazy, but … a long time ago (“Set the way-back machine Sherman…” –Mr. Peabody) when i used to make fimo barrettes, i discovered that if the barrettes were not made in France, to forget about them. The ones that were french/said “made in France” were stiffer and “locked” better and could handle lotsa’ hair! Can you explain the end of the Multidirectional scarf to me. I want to use the alternative ending so I come up with the half triangle at the end. Somehow I’m just NOT understanding the directions as written. I knit a scarf,thinking all along “Is this as ugly as I think it is?”. When finished I asked my husband that question. He said “What are you going to wear it with?”. I showed him the jacket, and he said “Looks great with that”. So, find a sweater or jacket which picks up the color you don’t want to emphasize. That color will visually fade into the jacket and the other colors will “pop”. Example: Wear it with brown and the pink and orange will “pop”. Hey knitters my husband and 2 kids will be going to Seattle Washington next month for a little trip, I was wondering if anyone knows if there is any knitting stores in the area or knitting festivals going on for the month of August. please help!